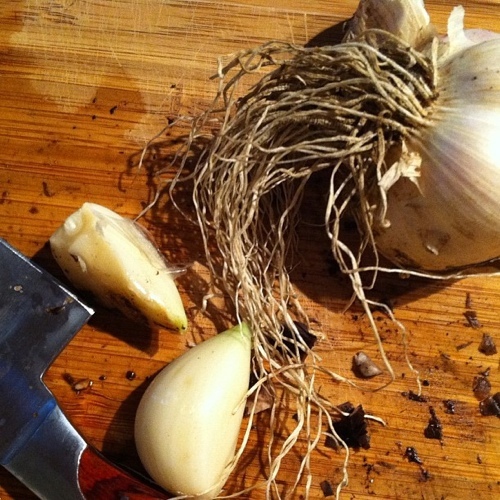 This recipe isn’t really about garlic though. It’s about mushrooms. But earthy mushrooms and dirt-covered garlic compliment each other so well, so I suppose it can be about both of them. Neither is really all that much of a showy attention hog, so I think they’ll be okay with sharing the spotlight this time. So onto mushrooms. One of my favorite ‘meat substitutes’. I’ve heard plenty of vegetarians/vegans try to convince meat-lovers that a grilled portabello cap tastes just like a steak. This, I’m sorry to have to tell you, is entirely untrue. A portabello does not taste just like a steak and never will taste just like a steak no matter what you do to it. And really, they don’t need to taste like a steak! They’re perfectly delicious in their own way, filled with all of that juicy, meaty, umami goodness. A similar flavor profile to steak, certainly, but an entirely different (vegetarian) beast. I can only guess that this whole mushrooms = meat belief is similar to the one that I held after a few years of vegetarianism, namely that Boca Burgers tasted just like hamburgers (and it was for this very reason that I refused to eat them). You just kind of forget what meat tastes like after awhile. It was quite the surprise, I assure you, when I ate my first burger after falling off the wagon a decade or so into my veggie life and discovered how wrong I was in that belief! But despite their differences, mushrooms do make a phenomenal substitute in many recipes that traditionally call for beef. Like beef stroganoff. A dish that I always enjoyed, but not so much for the beef as for the sour cream laden noodles. So one day when I was craving those creamy, paprika spotted noodles I came up with this recipe to satisfy my stroganoff need. It’s quite a bit lighter than a traditional stroganoff with just the bare minimum of sour cream needed to give it that authentic flavor. That being said, to keep it flavorful it needs an assertive stock, good quality paprika, real butter, and a little of that yummy garlic previously mentioned. It’s a warming, comforting dish that I normally enjoy in the cooler months, but is also always welcome on those summer days when we get a bit of a respite from the heat. As I already mentioned, quality ingredients are important in this recipe. Use a good Hungarian paprika and some vegetable stock that tastes delicious on its own. I make my own stock because it’s just so easy and it tastes a hundered times better than anything I can find in the grocery store. It also allows me to control the amount of salt that I cook with. That being said, if you are using a store bought stock that isn’t low-sodium, you’ll likely need to cut back on the salt quite a bit. I’d add just the initial salt with the onions and then salt to taste just after adding the sour cream. Put a large pot of water on to boil for cooking the egg noodles. Heat the butter and olive oil in a large, deep skillet or dutch oven over medium-high heat. Saute the onions with 1/2 tsp of the salt until the onions have softened. Add the garlic and mushrooms, cover, and cook for about 5 minutes until the mushrooms are beginning to soften and start to release their juices. Uncover and continue to cook until most of the mushroom liquid has evaporated, about 5 to 8 minutes. Sprinkle the paprika and the remaining 1 tsp of salt over the mushroom mixture and stir to combine. Sprinkle the flour over the mushrooms, stir to coat, and then cook for a minute or so, stirring occasionally. Deglaze the pan with the vermouth, then add the vegetable stock. Bring to a boil, reduce heat and simmer, stirring occasionally, for 10-15 minutes until the sauce thickens slightly. While the sauce is simmering, cook the egg noodles according to the package directions. Drain, toss with a bit of butter or olive oil,, and set aside. Remove the mushroom mixture from the heat and stir in the sour cream along with half of the parsley. Taste for salt and add a bit more, if necessary. 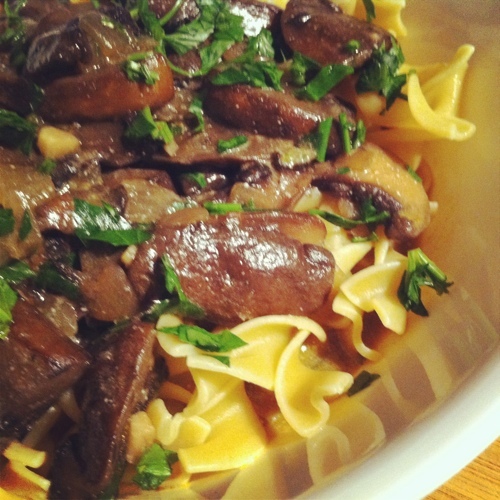 Mound the egg noodles into serving bowls and ladle the stroganoff on top. Garnish each bowl using the remaining parsley. That looks amazing. I have to try this recipe!! I’m on a total mushroom kick right now. I have something of an ongoing love affair with mushrooms, so expect many more ‘shroom filled recipes in the future!